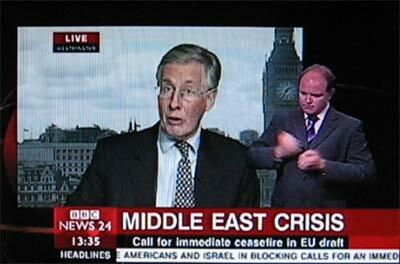 I was watching BBC News 24 when I noticed an entertaining technical problem. 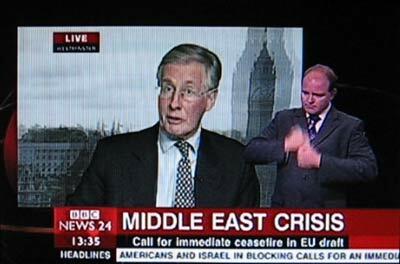 Michael Meacher was being interviewed “Live from Westminster” and the backdrop, as if to prove this, was a view fo London and Big Ben. 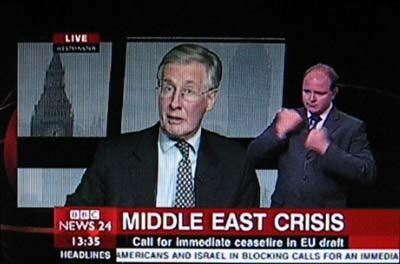 Suddenly though, rather embarassingly the background ghosted and then died, showing us that Mr. Meacher was actually sitting in some little studio. 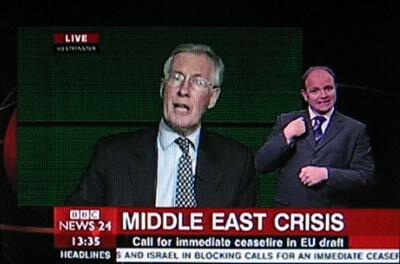 The BBC quickly cut away to stock footage of Iraq. The presenter never mentioned the glitch. (Note that the figure on the right is a hand-signer added over the top who is supposed to be there).